Governor Andrew M. Cuomo today signed new legislation allowing full union dues to be deducted from New York State taxes. The FY 2018 Enacted Budget creates a union dues deduction for New York taxpayers who itemize deductions at the state level equal to the amount currently disallowed at the federal level due to the 2 percent floor. The deduction is expected to save 500,000 hardworking men and women $35 million annually or about $70 per taxpayer per year. "At a time when unions are under attack on the national level, New York is fighting even harder to preserve union jobs and uplift the middle class," Governor Cuomo said. "By allowing full deduction of union dues, we are providing more than just a financial benefit, but also a strong demonstration of our unyielding commitment to defending union jobs as a pathway to the middle class." Currently, New Yorkers paying state and local taxes who make charitable contributions and pay mortgage interest are likely to claim itemized deductions on their federal tax returns. Many who itemize for federal purposes, may also itemize on their New York State tax returns. An additional, but less frequently used deduction, applies for a group of miscellaneous expenses, such as union dues, professional society dues, the cost of work clothes, tax preparation, and out-of-pocket job expenses. A floor applies in which only amounts in excess of 2 percent of taxpayers’ adjusted gross income (AGI) are deductible. The floor, therefore, likely prevents deductibility of a significant portion of union dues at the federal level, and in turn fails to lower the “top line” starting point for the taxpayer’s New York return, i.e. Federal taxable income. The FY 2018 Enacted Budget rectifies this inequity and creates a full union dues deduction for New York taxpayers. The new deduction applies both to New Yorkers who currently receive a deduction for only a portion of their union dues, or those in excess of 2 percent of their income, along with those who currently receive no deduction because their total miscellaneous deductions fall below the 2 percent established federal floor. The new measure is expected to save approximately 500,000 New York taxpayers $35 million annually, or $70 on average per taxpayer per year. "By allowing full deduction of union dues, we are providing more than just a financial benefit, but also a strong demonstration of our unyielding commitment to defending union jobs as a pathway to the middle class." The legislation builds on the Governor’s commitment to strengthening and supporting organized labor. In 2015, New York enacted a first-in-the-nation $15 minimum wage, passed the country’s strongest paid family leave program and launched the Joint Enforcement Task Force to protect workers from fraud and abuse. In the last three years, the state has recovered and returned a record-breaking $109 million in unpaid wages to 84,000 workers. At the same time, New York is in the midst of one of the nation’s most ambitious infrastructure programs in generations. In partnership with local and federal partners, $100 billion is being invested in infrastructure projects across New York to promote economic development, create jobs, and expand opportunity. These investments are enabling New York to rebuild and modernize its roads, bridges, broadband networks, public buildings, and other critical infrastructure across the State while putting thousands of people to work. Mario Cilento, President of the New York State AFL-CIO, said, “On behalf of the 2.5 million members of the New York State AFL-CIO, I want to thank Governor Cuomo for once again taking the lead and recognizing the value of union membership and the importance of providing the Labor Movement with another helpful tool for organizing working men and women. This new benefit will put an estimated $35 million back into the pockets of our members in private sector, public sector, and building trades unions throughout the state. We welcome this new benefit particularly at a time when the right of working people to join a union is increasingly under attack. I want to also thank Speaker Heastie, Majority Leader Flanagan and Independent Democratic Conference Leader Klein for listening to the working men and women of this state and understanding how this new provision will positively impact the lives of all New Yorkers." Vincent Alvarez, President of the New York City Central Labor Council, AFL-CIO, said, "This measure will help keep more money in the pockets of hardworking New Yorkers, many of whom are already struggling to raise families and live with dignity in New York City. On behalf of the 1.3 million working men and women of the New York City labor movement, I commend Governor Cuomo for standing up for working people." Gary LaBarbera, President of the 100,000 member Building and Construction Trades Council of Greater New York, said, "For decades, Governor Cuomo has been a consistent and proud champion of organized labor. By including the ability to deduct union dues from taxes, he has taken that proud legacy even one step further, once again uplifting our hardworking brothers and sisters in labor and helping them keep more money in their pockets. We proudly applaud this initiative and thank Governor Cuomo for his leadership in strengthening organized labor and providing greater economic opportunity for all New Yorkers." Jim Cahill, President, NYS Building and Construction Trades Council, said, "While other states attempt to weaken labor, Governor Cuomo is doing everything in his power to strengthen unions and stand up for our rights to work together for greater opportunity for all New Yorkers. By allowing union members to deduct their dues from taxes, Governor Cuomo's budget will help make unions even stronger and support their growth. Governor Cuomo's leadership on this issue is unmatched, and we hope that all states follow New York's proud example." Peter Ward, President of the New York Hotel & Motel Trades Council, AFL-CIO, said, "Throughout the years, organized labor has had no better friend than Governor Andrew Cuomo. 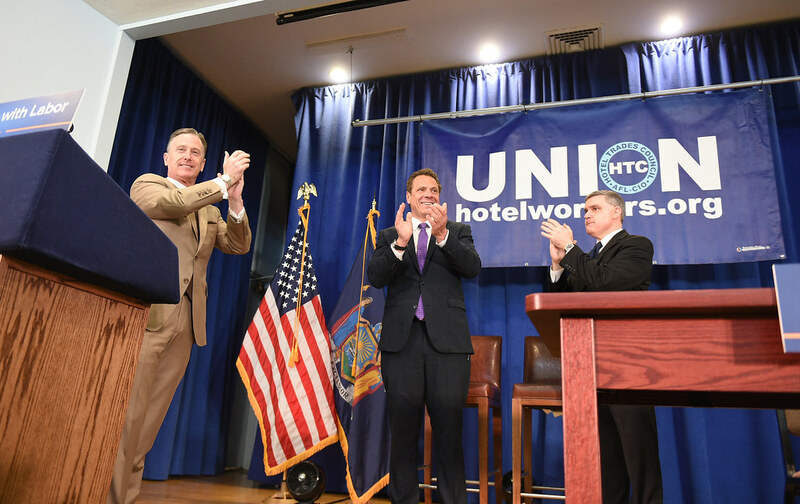 We were proud to fight alongside the Governor as he made paid family leave and a $15 minimum wage a reality, and we are just as proud to be part of today's trailblazing win for working people," said Peter Ward, President of the New York Hotel Trades Council. "On behalf of our union's 35,000 members and their families, I offer a heartfelt thanks to Governor Cuomo for helping New York's working people claim another victory today." George Gresham, President, 1199SEIU United Healthcare Workers East, said, "This is a common sense measure that will align state tax policy with federal policy and allow hard-working New Yorkers to keep a little more in their pockets at a time of rising prices. We applaud Governor Cuomo and the Legislature for including it in the recently passed State budget." Michael Mulgrew, President of the United Federation of Teachers, said, "This legislation is a show of support for unions and the work they do protecting the rights of ordinary people. Other states are rolling back these rights. Not New York. I want to thank the Governor and the Speaker for making middle class and working families a priority." Hector Figueroa, President of SEIU Local 32BJ, said, "We thank Governor Cuomo signing into law the Middle Class Recovery Act and union dues deduction to ensure that New York State supports union members. Governor Cuomo has once again led in the fight for everyday New Yorkers. Together with the historic passing last year of a statewide $15 minimum wage and family paid sick leave, New York is leading the country in the fight for the middle class. Thank you, Governor Cuomo, for being a champion of working families." NYSUT President Andy Pallotta said, "Unions play an important role in strengthening the middle class. This tangible benefit to union members comes from government and organized labor taking a collaborative approach to helping workers. This new law helps cement New York's place as one of the most worker-friendly states. It is something we can all feel good about." Robert Bonanza, Business Manager of the Mason Tenders District Council, said, "Governor Cuomo once again proves himself to be a friend of the working people in New York. This initiative not only recognizes the value of organized labor, but creates an incentive for others to join unions and begin climbing the ladder to the middle class." Thomas Carey, President, Westchester-Putnam Labor Council, said, "Time and time again, Governor Cuomo stands tall as a true defender of New York's middle class families. His tireless advocacy on behalf of our working middle class brothers and sisters sends a clear message that this state stands behind labor unions. Thanks to the Governor's budget this year, members can now deduct dues from their taxes, helping to keep more hard-earned money in their wallets and building up New York's middle class."